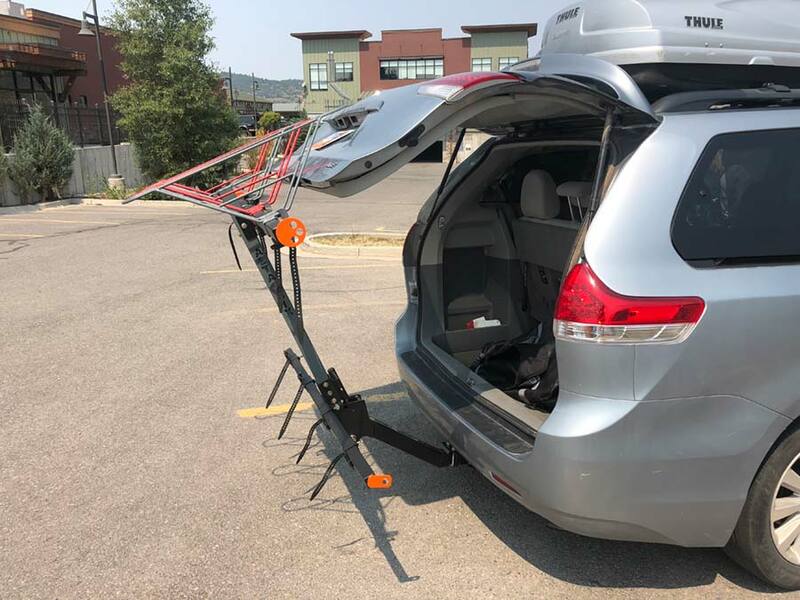 We have been through our share of bike racks, so when we got the opportunity to demo the Alta Six GPR (general purpose rack) from Alta Racks, we had some high hopes. Phase One, Pre-Kids: No bike rack. My wife and I would just take the front wheels off of bikes and get them in a car somehow. Phase Two, Pre-Kids: We had a rack that would strap onto the back of a car and it would hold a couple of bikes without rear suspension. Phase Three, with Kids: A hitch rack where we would hang bikes off the back. This would hold bikes fine, but they would bang together resulting in broken components and scratches. We even had to get a couple of adapters so all four bikes could fit on the rack. This was a mess and a waste of money. Phase Four, with Kids: A hitch rack with horizontal trays. We still have to put the bikes on a certain order so the bars and components don’t touch, but this has been a functional solution. Our current rack is only good for bikes. It cannot hold skis or be used as a foundation for other accessories. 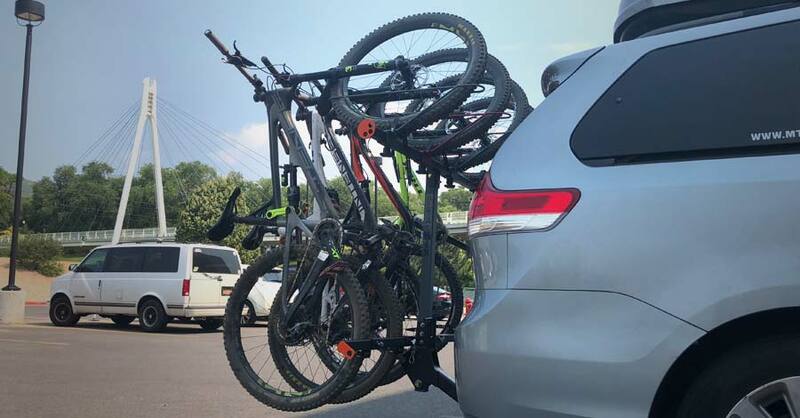 The Alta Six bike rack is the next step in bike rack design and functionality. The bikes are attached vertically on an Alta Rack where the front wheel is secured in a slanted basket. The bike’s rear wheel is fastened to a a lower support and a 2-inch hitch is required for the system we tested. With a background in military design engineering, the company’s principal knows what it takes to design a durable, ergonomic product that is easy to source and produce in America. Utilizing latest technology in metal fabrication to ensure high precision in build which leads to longevity, Alta Racks are build to last. None of the hardware on the rack is proprietary, and can easily be replaced at the local hardware store. As of this writing, racks are available in the following colors: black, red, dark gray, desert tan, and orange. Custom colors are also available. Everyone’s Heard Of #morekidsonbikes – What About, More Bikes On Cars? The baskets for the front wheels are slanted to the left so the bike’s handlebars do not touch. This is a practical solution that not only succeeds in eliminating one bike touching another and getting damaged, but it allows up to six bikes to be stored on a rack instead of just four. The front and rear wheels are secured to the rack using heavy duty Voile power straps, again a solution that is non-proprietary. The rack will hold 24-inch mountain bikes to 29-inch wheel mountain bikes easily. 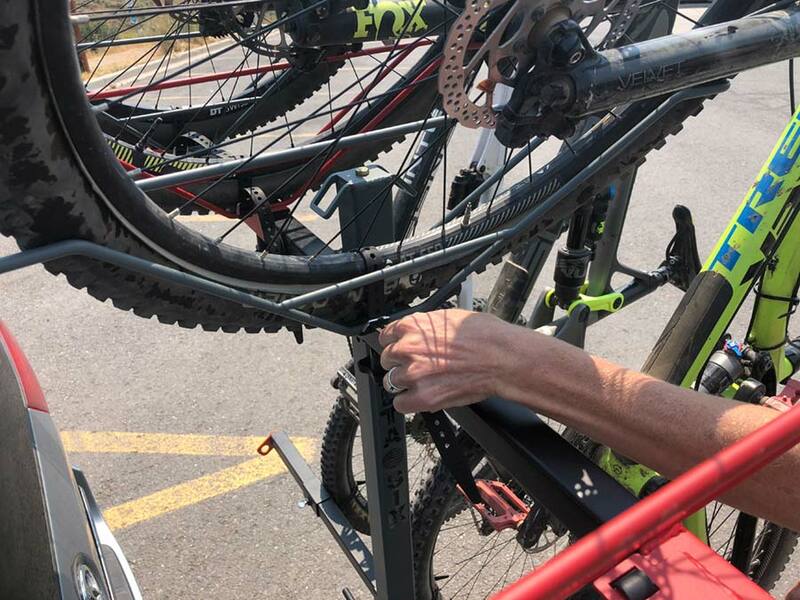 The rack can also hold smaller mountain bikes with 20-inch wheels and bmx bikes, but there may be some contact with the rack. Bikes with wheels smaller than 20 inches need to be stored inside, or on top of the vehicle. 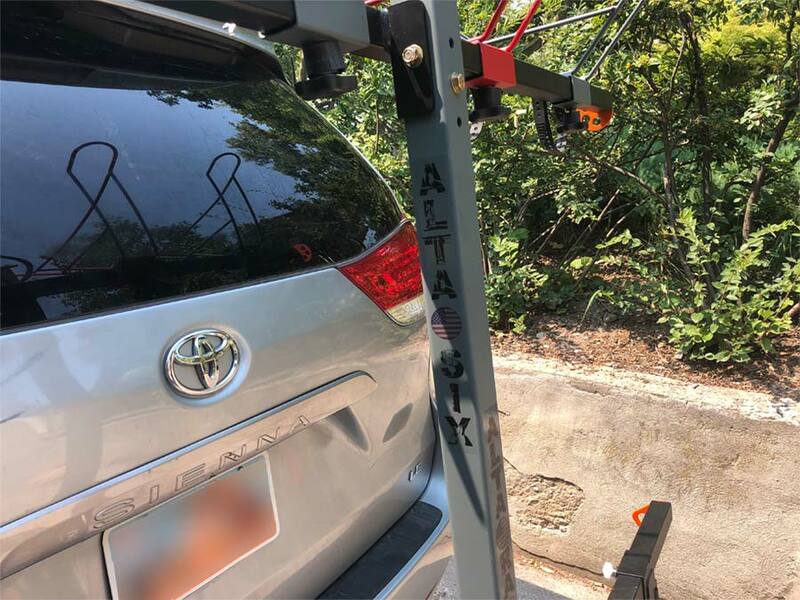 Attaching the rack to our mini-van was easy because the two bolts that needed to be secured to the hitch were accessible from the top side of the bumper. And, the weight of the rack is over twenty pounds less than our current tray rack. Loading the bikes into the rack was simple for me, my wife and my 15 year old son. Our 11 year old was just too short. It has to be noted that he is also too short to load all the bikes into our tray rack. To load the Alta Racks system, all you have to do is lift the front wheel of a bike high enough to clear the basket on the top support beam; angle the wheel to the left and gravity takes care of the rest. 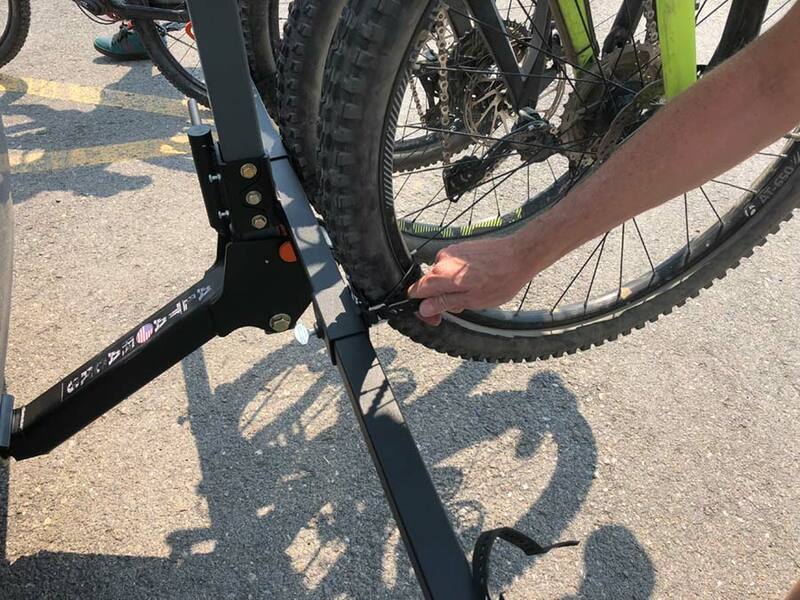 Align the bottom wheel below the top basket so the frame of the bike is straight up-and-down and strap the wheels in place using the provided Voile power straps. The bikes do not hang, they are nestled in the upper baskets and the weight is distributed from the front of the bike to the rear wheel’s contact point on the lower support. It’s important that you load bikes from right-to-left due to the orientation of the baskets for the front wheels. This way, the bikes horizontally ‘stack’ so the handlebars and levers do not contact each other. My son started loading the rack backwards, from left-to-right and I just let him struggle. He had to work hard in order to put each consecutive bike under the preceding bike. In the video, you can see him do it in the correct order. Bikes can be secured to the rack with a cable lock (not included). When the bikes were properly loaded I gave the rack a good shake to see if there was any play or movement from the rack’s tongue to the hitch and nothing moved. It was very secure and stable. For off-roading, you can increase the stability of the rack by attaching guide lines from the upper ends of the top horizontal tube to the hitch bar. Next, we hit the road. 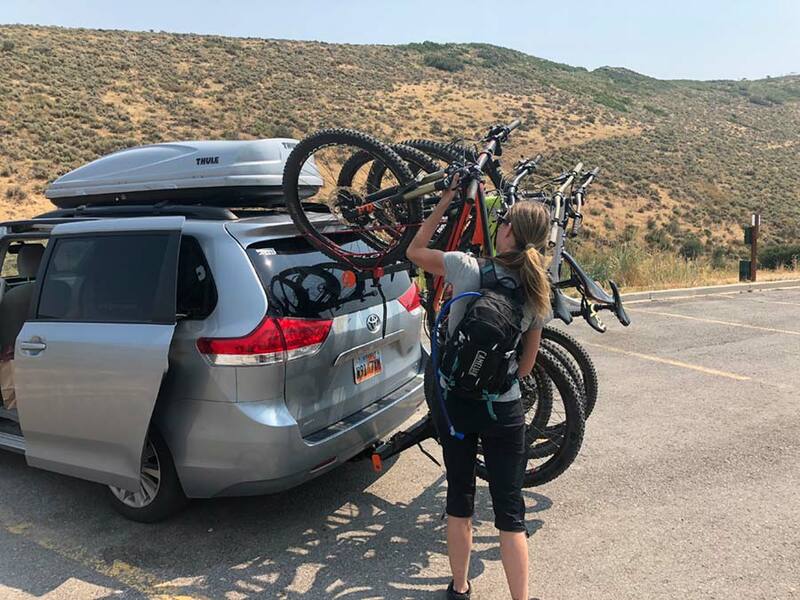 It took a few minutes to get accustomed to a different style of mountain bike rack on our van when we started traveling. The rack did not vibrate at all. None of the bikes shifted while in transit. I even had clear vision between the bikes in my rear view mirror. 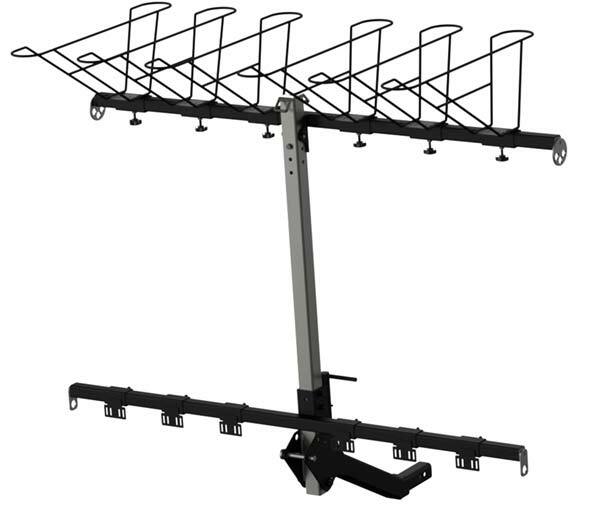 The current version of the Alta Racks, Alta Six GPR is the fourth iteration of the system. Initially launched in may of 2017, the rack’s dimensions, features and designs are still being tweaked. The owner of the company knows who to ask for feedback, too. His bike racks have been tested by shuttle companies in Moab running mountain bikers up to the top of world famous Whole Enchilada route. Alta Racks has even enlisted pro mountain bike freeriders who have competed in the Red Bull Rampage to help with getting important tips on how the system can be improved. The rack will pivot from its base so you can open your vehicle’s rear hatch door or tailgate. Although our mini-van’s rear hatch could not be opened all the way, it did allow us to access the cargo in the back such as a travel bag or tool box. Be sure to check the Alta Racks website so you can see all the options for this system. 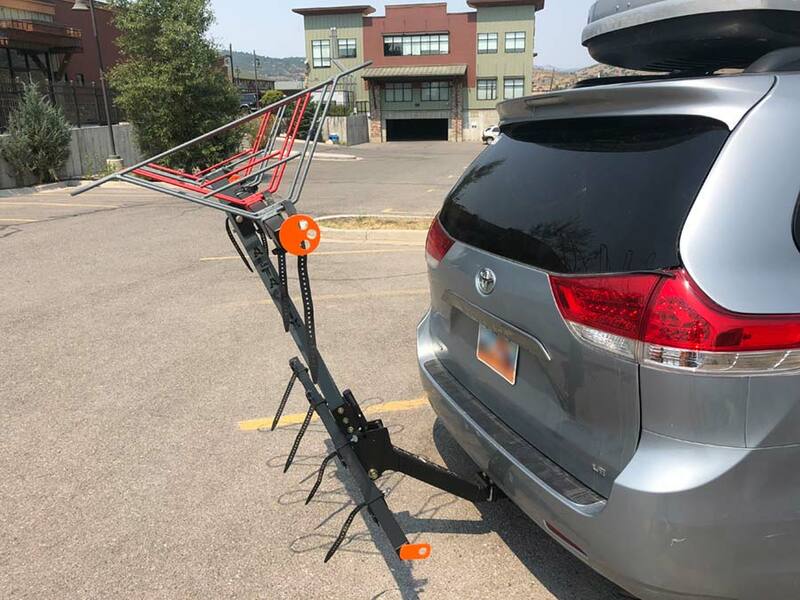 Other sports items can be transported and accessories can be used with the rack such as: skis, a repair stand, motorcycle attachment, hammock and table. Shade systems are on the way as well. We enjoyed using the Alta Racks, Alta Rack Six GPR. 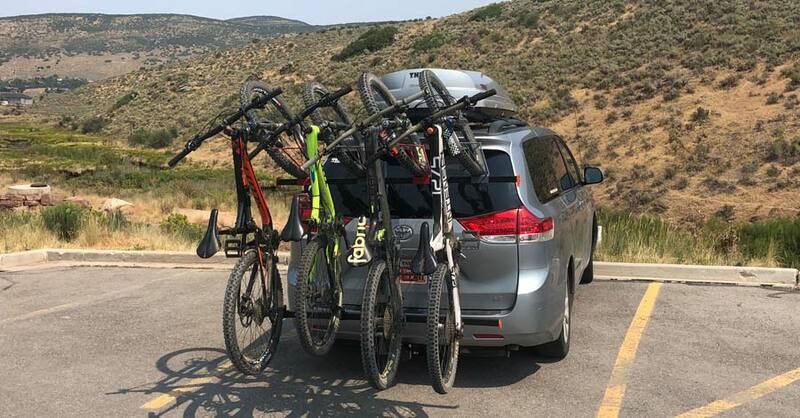 Even though it’s designed as a utilitarian solution to be used for several applications, it’s ability to transport more than four bikes makes it a great option for mountain biking families. It checks off everything you want in a mountain bike rack. It’s easy to load and unload. It’s durable and made in the USA. And most importantly for us, the bikes get securely attached to the rack without touching. 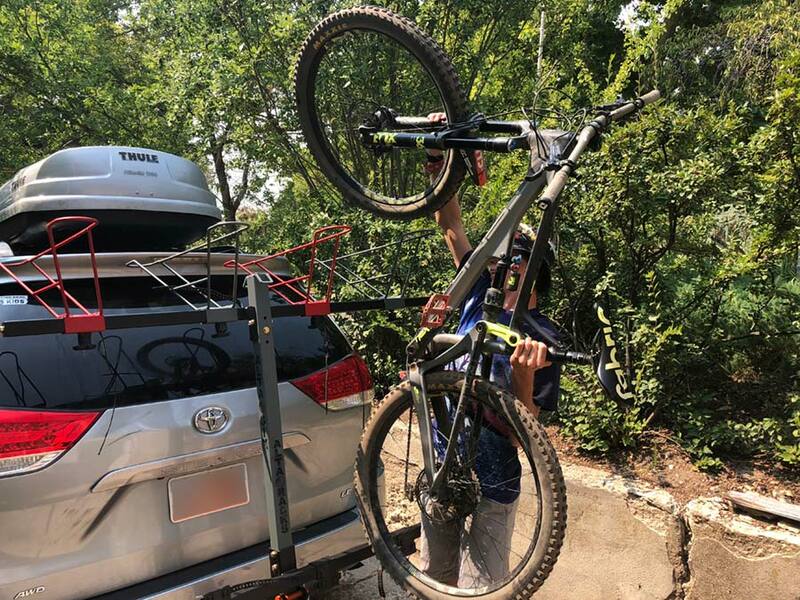 When you’re ready to upgrade your old hitch rack or need a system that can hold more than four bikes, take a look at Alta Racks.